Often described as Austria's friendliest holiday setting, the two villages of Neukirchen and Bramberg are situated at the foot of thenWildkogel and share the ski area of the same name. Set in the heart of the Hohe Tauern National Park there is a wealth of things to see and do for both winter and summer holidays. The area boasts superb hiking trails, both on the valley floor and at high altitude. There is a great choice of cycling paths - including the Tauern Cycle path which passes by both Neukirchen and Bramberg. The area is one of outstanding natural beauty and truly offers something for everyone. 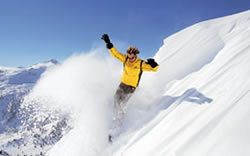 curling, tobogganing (14km toboggan run at Bramberg), sleigh rides, fitness and wellness centres, cross country skiing. cycling, walking, mountain biking, paragliding, tennis, golf, riding and much more. very austrian-style apres ski - friendly and fun. Pretty, charming guest houses and hotel bars.